Who’s the King of the Birds? The little explorers and I are always keen to tackle a new adventure so we were very excited to test out the new park trail. We love birds, we love stories and we love looking for hidden things so it seemed like a perfect afternoon adventure. The trail map from the park café (suggested donation £1) only added to the excitement with its beautiful illustrations by Gerard Hobson. The trail takes you on an imaginative adventure, following the story of the little sparrow who wanted to find out who should be king. We followed the sparrow on his journey to meet all the different birds in the park, each telling him about their special quality which would make them the best king. We loved spotting and identifying the wooden birds in the trees and the littlest explorer had a great time peeking in the bird boxes to find the clues. There are some steps on the trail so it’s not ideal for pushchairs (though you can avoid that part of the route) but even my little 2 year old managed the walk without any problems – in fact most of the time he was running to get to the bird box before his older brother! The paths are good and the trail takes you through some of the lesser visited areas of the park which only adds to the fun. Trail complete, we headed back to the café where the lovely staff gave both children a beautiful bird badge (which they are still wearing proudly) and a colouring sheet. Who was king of the birds? You’ll have to try it out for yourself to find out! The Very Young Friends have been out and about! 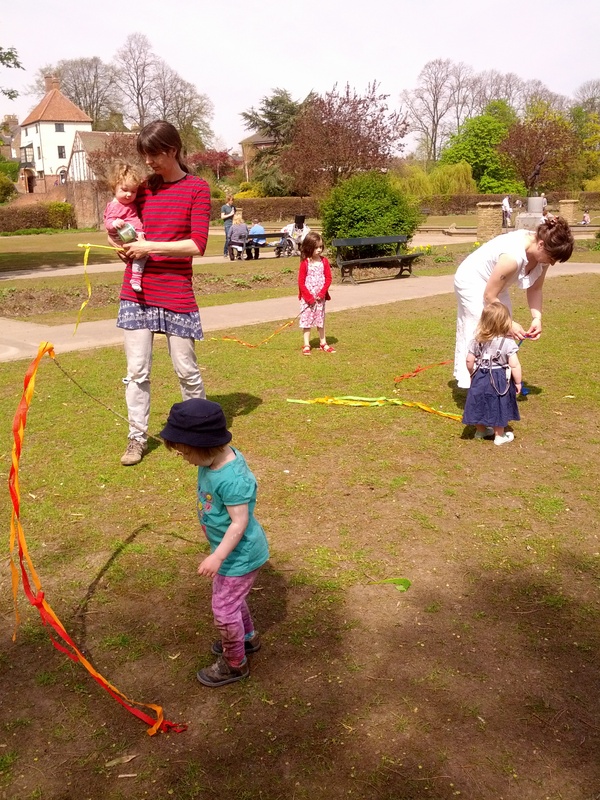 Each meeting has a different theme and the theme in June was ‘finding fairies’ – I’m not sure how many were found, but much fun was had with ribbons in the sunshine, as you can see. Young ones and their parents/carers are very welcome to join in, for as little or as much as seems good at the time – this is an easy-going session for all! The Very Young Friends can’t guarantee the weather, but they’ll be there to greet you, at the little bridge by the cafe, at 11am on the first Monday of the month. Next month (Monday July 1st), the theme is ‘All the busy insects’, so everyone will be creeping and crawling and buzzing about like bees … bzzzz!!! Francesca leads the Very Young Friends, and she can be contacted on 07533 475 929. I think it’s safe to say that Spring has arrived in Rowntree Park. There is birdsong to be heard and the sun is shining onto the waters of the lake that were solid ice only two short weeks ago. Everything looks very fresh and green, and the air is noticeably warmer. There are buds on the trees, but still only very wee ones. This means that if you stand still under one of the very tall trees along the Ten Tree Trail and lean your head back as far as you can and peer up to the very tip top of that very tall tree, you can still see the squirrels running about up there. It’s worth a try – your neck might ache after a while but you’ll be rewarded with the sight of some pretty amazing furry-tailed acrobatics that will be hidden later in the season by a thick screen of leaves. I did this the other day with my four-year-old son, and we saw a couple of the squirrels scampering about up there, seeming to defy gravity with their crazy leaps, never falling although the skinny branches they chose to dangle from bent and swayed dramatically. They criss-crossed back and forth between two trees, having a shouted conversation as they flew past each other in the air. We stood still and craned our necks as far as we possibly could, and listened in. This is the gist of what they were on about. And the two squirrels kept jumping around between the two trees in search of their hidden store – too well hidden! We kept looking up and listening in although our necks were pretty stiff by now. And with that, he scampered away, making a daring leap to a further-off tree top which swayed wildly as he landed. There was a thud as Beryl dropped the lumpy brown thing onto the ground at the foot of the tree, where it landed right next to my boot! My son picked it up immediately before I had a chance to wonder if small boys should handle things that squirrels have chewed recently. And what was that object? 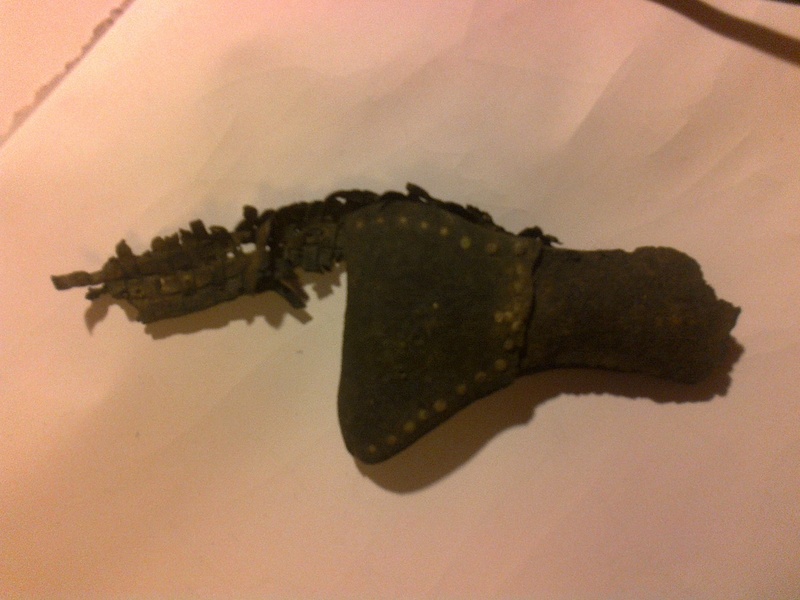 Well, here are some photographs of it – what do you think it is? Beryl thought it tasted like it had been buried for a hundred years, and in fact it really might have been. The land where Rowntree Park now stands was a dump in Victorian times, and many small objects have been dug up in the park that were indeed buried in that dump a hundred years ago or even more than that! 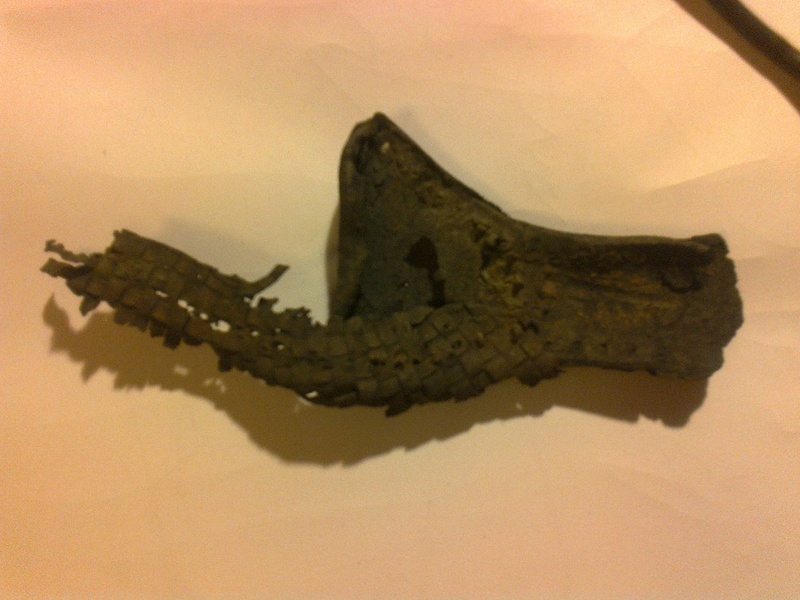 If you’d like to see the object that Cyril and Beryl dug up and threw down at my feet – and also get ready for Spring and welcome the new season to the park officially – then come along to the next meeting of the Very Young Friends of Rowntree Park on 6th March ! We meet at 12:30pm on the first Tuesday of every month at the pavilion [to the left if you come into the park through the big gates on Terry Avenue, just behind the tennis courts]. 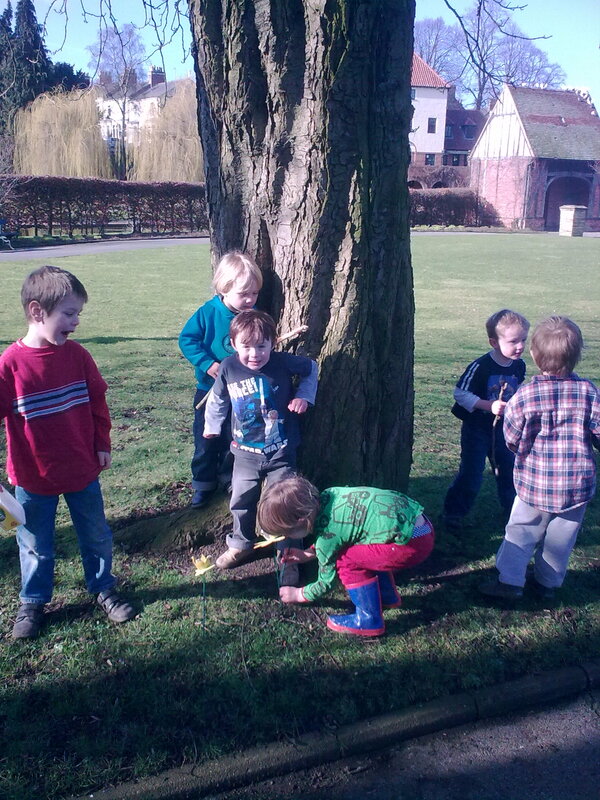 We have themed woodland trails and a picnic with songs, stories and arty activities. For under fives and their parents/carers. Bring your lunch! More info from Lara on 07941 448594. Once upon a time there was a small hill town not far from here called Shipton. In fact, there were lots of towns called Shipton, or Skipton – some of them are still there – and the name meant – and still means – ‘sheep town’. In this particular Shipton there were a few people and a lot of sheep. The people looked after the sheep, fed them, took them to places where there was fresh grass to eat, and rescued them when they got stuck in bogs or tumbled over cliffs. In return, the sheep surrendered their fleecy coats to their shepherds once a year, and the shepherds were able to spin the fleece into lovely soft wool which they knitted into warm clothes that they could wear, sell, and swap for other things with people from other towns and villages. The system worked pretty well for many years. What happened was this; in the Spring the shepherds would herd the sheep into pens and shear off their coats, and the sheep would feel wonderfully light and free and scamper off to eat grass and gossip. Their coats would then begin to grow back, which did feel a bit scratchy and uncomfortable, but by the time winter rolled around they would be fully woolly once again and ready to face the cold. And the following Spring they would get sheared again, and so on. Well, it may not surprise you to learn that, being a sheep, Baaarbara was quite easily led. She soon became convinced that the goat was right and set off to find her flock and urge them not to grow any more wool for the shepherds to shear off! And, like sheep – they all followed her lead. That year they did not regrow their fleeces. The shepherds couldn’t understand why their flocks stayed bald all through the year. They tried massaging the sheep [which the sheep really enjoyed], reading to them [they particularly liked the story of Little Bo Peep], and giving them extra lovely things to eat [yum! ], but nothing made any difference – the sheep stayed bald. The shepherds scratched their heads in bewilderment and the sheep bleated smugly, thinking they had somehow beaten the system. But then the winter arrived, and with it harsh, biting winds that whipped across the grasslands and chilled those naked sheep to the bone. In vain they tried to grow some wool to keep themselves warm, but it was too late – the growing season was over. ‘Baaarbara!’ they clamoured. ‘You silly sheep! You’ve made us stay coatless and now we’re cold!’ Needless to say, Baaarbara did feel a little bit sheepish. Just then, a young shepherdess named Fleecity came to check on her sheep – one of whom was Baaarbara – and overheard their conversation. ‘Ladies’, she said, ‘I have an idea which might solve our problem.’ And she went off to the town’s wool store and brought out all of the fleeces that had been stored there from previous shearings, waiting to be spun into wool for jumpers. She tied a fleece securely onto each sheep. They were warm again, and skipped delightedly around the fields bleating with delight. When Fleecity left to go home they all followed her, bleating out their thanks – which is why flocks of sheep today will still follow a person who comes amongst them. The old ram, Mutton Jeff, who despite being hard of hearing was relatively wise [for a sheep] declared that from that day on, sheep would always grow another fleecy coat after being sheared – and they still do till this day, despite anything that’s said to them by silly goats! If you’d like to celebrate all things woolly with the Very Young Friends of Rowntree Park, meet us at the pavilion on Tuesday 7th February at 12:30! Bring your lunch! For under fives and their parents/carers.